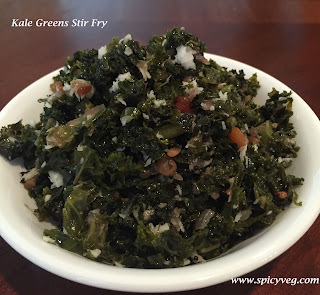 Stir fried Kale is a simple recipe and makes a perfect accompaniment for Plain Rice ,Rasam And Curd Rice.The various types of kale maintain a lot of texture, which makes them perfect for stir-fries. Kale is a member of the cruciferous family of vegetables (genus Brassica), so named because their flowers have four petals in the shape of a cross. A nutritional powerhouse that tastes wonderful when properly cooked. 1. Wash and drain kale leaves, remove the hard thick vein and chop the leaves finely . ( Instead you can use the packed kale greens). 2.Heal t oil in a pan ,add mustard seeds allow to splutter. 3. Add the channa dal & Urad dal fry till golden brown , then add dry red chilli, hing and chopped onions. 4 .Add a pinch of turmeric powder and stir well then add 1/4 cup water and close it with a lid and cook for 10 min. 5.Open the lid and give a gentle stir and now add shredded coconut and stir fry for a minute. 6. Serve hot with Plain Rice , Rasam or with curd rice. Nice recipe! Thanks for sharing.